Lisburn band The Diva Dolls are still on cloud nine after receiving fantastic feedback from the judges on the upcoming television show Ireland’s Got Talent. However, when someone suggested they put their talent to the test on the TV, they decided it would be a great opportunity to spread their wings and raise their profile. Ireland’s Got Talent returned for a brand new series on Virgin Media One on February 2 and the Lisburn band will appear on screen on February 9. Hosted by Lucy Kennedy, this year’s series sees an array of diverse performances, including international acts turning up to try their luck on the Irish stage in front of judges Denise Van Outen, Jason Byrne, Michelle Visage and Louis Walsh. 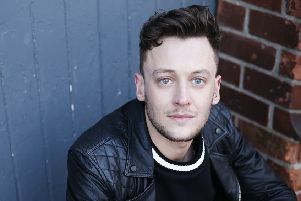 “The final audition was in front of the judges and a live audience at the Helix in Dublin,” explained Alex-Jay, who started the group four years ago. “Surprisingly, even though we have plenty of experience performing, we were nervous but we were excited as well. And they certainly managed to do that as the audience jumped to their feet in appreciation. They weren’t alone in their enthusiasm either as the four judges were blown away by the performance. If you want to catch the Diva Dolls in person, they have a monthly Sunday night residency at the Shoe Factory in Union Street in Belfast.